Location: The appellation extends over 3 counties: Bouches du Rhône, Var and a small part in the Alpes-Maritimes. West bounded by the foothills of Montagne Sainte Victoire, Côtes de Provence vineyard stretches to the high altitude terraces of Haute Provence. 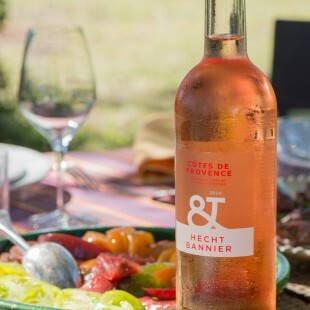 For our Côtes de Provence rosé we preferred a main touch of Grenache, which can be perfectly associated with Cinsault and Syrah as well. This appellation includes 3 very specific terroirs. Côtes de Provence Sainte-Victoire: East of Aix-en-Provence and close to Montagne Sainte Victoire, this terroir includes 9 towns: Châteauneuf le Rouge, Le Tholonet, Meyreuil, Peynier, Puyloubier, Rousset and Trets in the Bouches du Rhône county; Pourcieux and Pourrières in the Var county. Thanks to its geographical situation, the area can benefit from a moderate and continental climate. On one hand, the rock ridge of Montagne Sainte Victoire protects this terroir from the Mistral effects and on the other hand, Sainte Baume moutain also reduces the maritime influences. The soils are poor and deep, mainly limestone and sandstone, so that rosé wines here are almost marked by a vivacious and persistent minerality. Côtes de Provence Fréjus: The Mediterranean Sea has a key influence on this eastern part of Côtes de Provence which includes 11 towns in the Var county: Callas, Fréjus, La Motte, Le Muy, Puget sur Argens, Roquebrune sur Argens, Entrecasteaux, Cotignac, Saint Raphaël, Saint Antonin and Trans. This climate is a mix of stormy phases, average temperatures, and heavy rainfalls. In this area, 3 main sub soils can be encountered: red soils made of clay and sandstone, stony soils and sandy soils resulting from the Maures mountain erosion. The combination of these soils with a cool maritime influence and altitude vineyards, up to 350 meters, produces rosés wines with a lot of finesse and fresh fruit character. 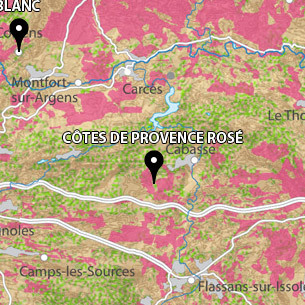 Côtes de Provence La Londe: This part of the vineyard is located in the south west of Maures mountain and includes 4 towns in the Var county: Bormes les Mimosas, la Crau, Hyères and la Londe les Maures. The immediate vicinity of the Mediterranean Sea influences La Londe terroir as it moderates temperatures all year long. It is also a dryer area compared to the rest of the appellation however sunshine and the fresh air are always here to compensate it. Although the soil is here poor in organic matter and mostly composed of clay and schists, winegrowers produce rosés of remarkable balance and finesse. Likely on the rest of the Mediterranean amphitheatre, sunshine is definitely the first characteristic of the Provencal climate, with 2700 to 2900 hours per year. During fall and spring, rainfalls happen to be heavy but summer is always dry and warm. Altitude and winds are the other characteristic of the area. The vineyard is scoured by several airstreams: thermal winds from the sea or, northern cold Mistral, it may be violent and very dry but it still an asset for the vines by guarding against most of diseases attacks. We want our Rosé charming, but still preserving the mineral character from the Great Rosé from Provence, floral and complex. 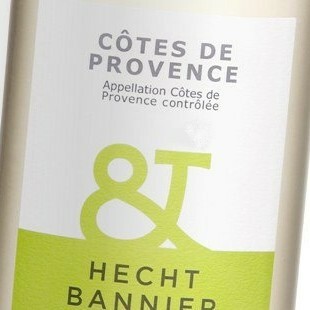 Our Côtes de Provence Blanc Bio is a lively seductive wine expressing notes of fennel, star anise and garrigue.